Lentil & Walnut "Ground Beef": It's Magic! So I’ve been on this plant based journey for quite some time so I’ve tried out a lot of “substitutes” for meat and cheese. Most have been subpar but as the demand for vegan products has grown, companies have really stepped up their game! From Beyond Meat and the Impossible Burgers, to Daiya Cheddar Slices—we’ve got some pretty good options! Even with these increasingly tasty substitutions, I still prefer a more whole foods approach. That’s where this combination of Lentils and Walnuts comes in! Both lentils and walnuts are relatively inexpensive but EXTREMELY nutritious! The best thing about this combination is how versatile it is. Basically any recipe that calls for ground beef, you can sub with this magical combo and be left completely satisfied. I’ve made Korean “beef” dishes, taco bowls, tacos, BBQ, meatballs, and most recently delicious breakfast sausage! All of these variations take less than 10 ingredients and just require a few different spices to reach the desired flavors. Simply add some taco seasoning and you’ve got traditionally tasting tacos or taco salad! Add Italian seasoning (or make your own! ), flax egg, and some gluten free breadcrumbs and you’ve got yourself some delicious and traditional meatballs! Take a look below for a couple specific recipes and then let your imagination run wild! A basic 1:1 ratio of lentils and walnuts is the base for any variation. 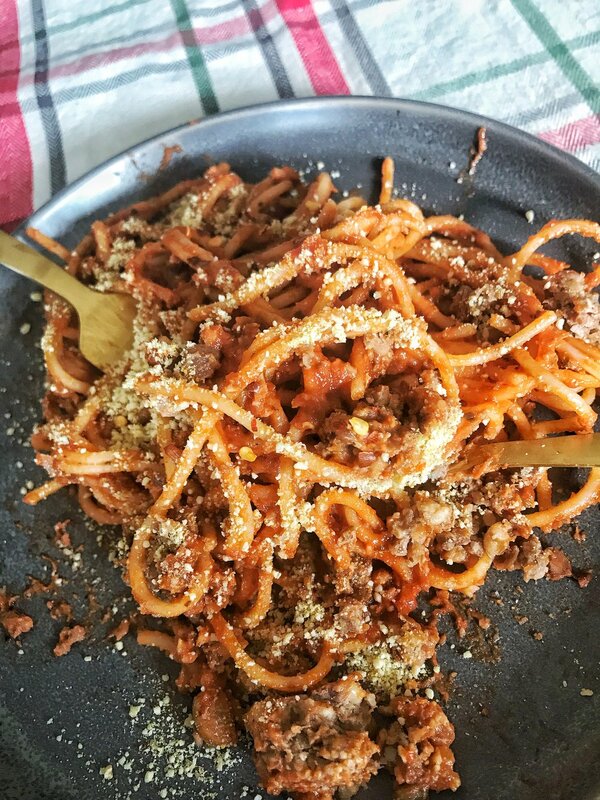 A couple quick pulses in your food processor and then baking or sauteing is all it takes before you’re devouring a delicious and hearty meal-minus the grease, cholesterol, and animal cruelty! I call that a win-win-win! Cook lentils (1 cup dry brown or green lentils + 2 1/4 cups water. Bring to boil, let simmer for about 20-25 minutes until water has been absorbed/lentils have softened). *It is important that your lentils are not too soft. Taste them at about 18 minutes. You want them to about al dente and NOT too mushy or you will wind up with a paste. While your lentils are cooking, combine your walnuts and spices into a food processor. Pulse until walnuts are about the same size as a lentil. You can taste this mixture to make sure you like the spice combination! Add your 2 cups of cooked lentils to the food processor and pulse 3-4 times just until combined. Transfer mixture to medium bowl and stir in (or use your hands) your flax egg. Form into patties-this recipe will make about 7 or 8 medium sized patties. Now the cooking method is up to you! I sauteed the patties in about 1 TBS of olive oil for 3-5 minutes on each side. You could also bake for 25 minutes, flipping half-way through at 375. Saute your onion in water or oil until softened-about 6 or 7 minutes. Add your garlic and continue cooking for another 30 seconds or until fragrant. Set your saute pan aside to use later. Add your onion, garlic, walnuts, lentils, and spices to a food processor. Pulse until combined and “crumbly”. Transfer to a mixing bowl and add your flax egg. Form into balls and bake for 25 minutes, turning half-way through. Return meatballs to your saute pan and add your marinara sauce. Turn your meatballs so they are coated and until your sauce has been warmed. Serve over pasta and enjoy! This combination was actually my husband’s idea! I was in need of some dinner inspiration and my husband suggested BBQ tacos. I didn’t have much on hand but I did have lentils, walnuts, and BBQ sauce! I think I also had some leftover slaw, or at least the ingredients to make it so it was really just meant to happen! Since then we’ve made this many times and it’s become a family favorite! Add all ingredients to your food processor and pulse until combined. Add to a saute pan and saute until the the mixture becomes crumbly and has “browned”. It will mimic the look of ground beef. Taste test to see if you want to add any spices or more BBQ sauce. Warm up some tortillas in the oven, and assemble your tacos! Add the BBQ ground beef, more BBQ sauce, and vegan coleslaw. These are only a few variations out of many possibilities! What else can you come up with?! Leave a comment or let me know on social media: @plantbasedplanner! Easy Sugar-Free Hack & Your New Favorite, No Fuss Granola Recipe!